Well the weather in New York yesterday was miserable; cold, snowing and windy. If you are one of those people who read this blog and know both me and Lisa though, you know that we are just about the two least likely people oh earth to be held back from something we planned and were looking forward to. So we suited up in sine very warm gear and watching Hunters boots and headed to Rockefeller Center. Yes, braving the cold and snow was worth it for this. 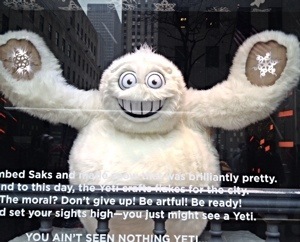 Then we crossed the street to see the Saks Fifth Avenue window display. This year it tells the story of a Yeti who wants to create the perfect snowflake and I think it’s among the best they’ve ever had. We went in to Saks afterwards to warm up and see the Christmas decorations inside and then we strolled Fifth avenue as I pointed out all the decorations to Lisa, explaining to her which were new and which displays I’d been seeng my whole life. We popped in to Tiffany’s to warm up too then headed to the Eloise shop in the Plaza and finally made our way towards Columbus Circle. As we walked past Columbus Circle we saw people playing in the snow in a now white Central Park. We headed in to the Time Warner Center to look at their decorations and warm up again! 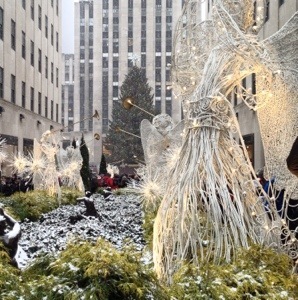 And then we braved the cold and snow to walk around the Columbus Circle holiday market. Finally, tired and chilled to the bone, we headed back to my place to dry off and then I took Lisa to meet Chris because we have mutual friends who are expecting a full report from Lisa about my boyfriend (I’m pretty sure Lisa will give him a glowing review btw). Finally, in the heart of our winter storm, we headed back out to Kefi, one of my favorite restaurants, for dinner. Kefi, an inexpensive Greek restaurant, is a neighborhood favorite. Last January a pipe burst in the restaurant shutting in down. Denizens of Upper West Siders like me waited patiently for Kefi to reopen. While it took them nearly a year to do that, I’m thrilled to report that they’re finally back in business. 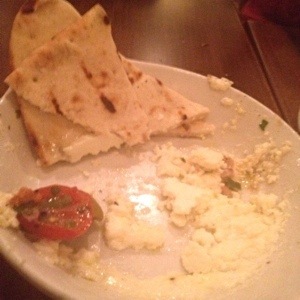 We split two appetizers to start. As usual I forgot to snap pictures until we were nearly done. Warm Feta, Tomatoes, Capers, Anchovy, Peppers, Olives served with Pita Bread; which looks really pretty with the green and black olives and ripe red tomatoes, but you’ll have to use your imagination. 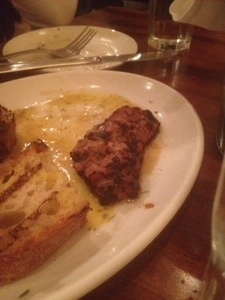 We also split the Greek sausage in some kind of lemon sauce which was delish. 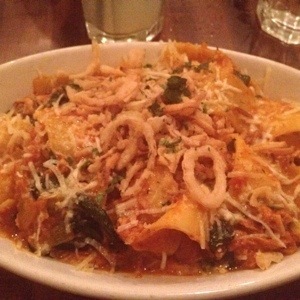 Every since Kefi closed I’ve been craving my favorite dish there, Flat Pasta, Pulled Braised Rabbit, Graviera Cheese. Of course I had to order it and it was just as delicious as I remembered. 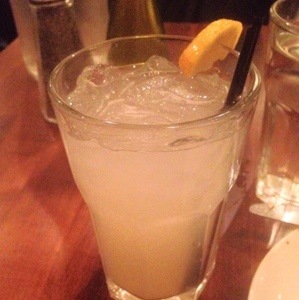 I also ordered my favorite drink there, the Lemonada, a lemonade based drink made with ouzo. The meal was delicious and the company was fantastic. Another day in the win column for me! Yep Chris definitely gets 2 enthusiastic thumbs up from me!! I had the best time on Saturday and while the snow made for a chilly day, it made it even more magical for me. I really miss December snow so it was nice to see some for a change. Dinner was so delicious, I would definitely go back. I was impressed by how inexpensive it was. I think you would be hard pressed to find a place with food of that quality with that low of a price tag in Charlotte honestly! I am so glad I got to be part of the birthday celebration! Miss you already!! Your day of walking from one holiday decorated area to another sounds divine! 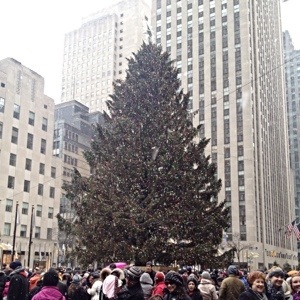 Will you give me the 5th Ave tour if we ever make it there during the holidays?! ?